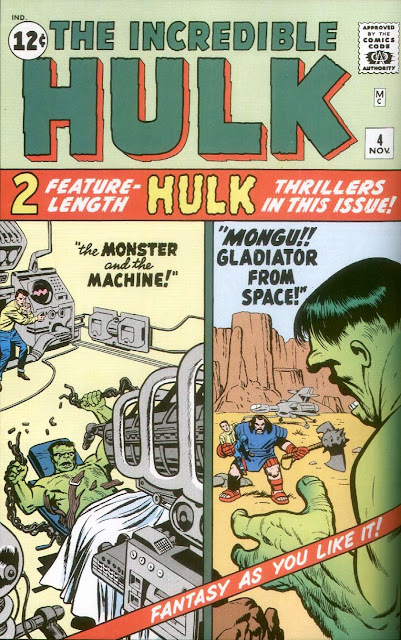 Well, it's issue #4 of The Hulk, and Stan & Jack are still messing with the formula. Reader Stature notes how obvious it is that they're "throwing anything and everything at the wall hoping to see what sticks." And it's true. What makes this approach so utterly mystifying, though, is that they're changing tack every single issue, without even waiting to see which take resonates best with the readers. What's goofier? That the army has created a Test Hulk? Or that their plan is to throw some ice at him? For instance, although the creature has been "dumb Hulk" for a couple of issues by now, this is the first time we get to see a spark of something more: the heart within the beast. When the Hulk passes by a school bus that's stalled out while crossing railroad tracks, he leaps in to push the bus out of the path of the oncoming train. And when Rick Jones wrestles with whether he's capable of using a machine Banner has rigged up to try to cure the Hulk, or whether he would just make things worse, the Hulk implores Rick to take the chance. We sense the pain the creature is in - and we know that, rather than physical hurt, it's the anguish he feels at the monster he knows himself to be. The Hulk, confused, tugs at our heart strings. Much like a cute puppy. And yet, despite this welcome character development, the device eventually changes Banner once again ... to even more cunning and mean than he was in the first issue. This time it's specified that the creature has retained Banner's mind (which wasn't altogether clear in #1), but otherwise it's a retread to square one - which makes you wonder why they started switching gears at all. Except, that is, for the fact that Banner has also rigged the machine to change him back and forth with the touch of a button. Essentially robbing him of the tragedy of the character, and turning the Hulk into little more than a suit he can slip on and off at will! It's astounding how they can hit so solidly, and yet so solidly miss the mark, all in the same issue. 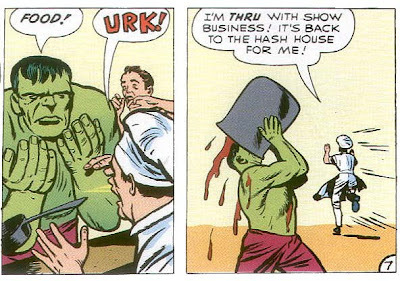 And the Hulk's famous love for baked beans (no lie!) was born. Seriously: Don't - Mess - With Hulk!